foot-propelled aquatic birds, which occur in Africa south of the Sahara and in the tropical areas of South America/Central America and Asia. Oberholser, 1917 (="Quercyrallus ludianus" Brodkorb, 1963) from the late Eocene of the Paris Gypsum, a long-beaked species which is based on an incomplete and poorly preserved skeleton (Cracraft 1973a; Olson 1977b). "Quercyrallus dasypus" (Milne-Edwards, 1892) was synonymized with the galliform Palaeortyx gallica by Mourer-Chauvire (1992a). Megagallinula harundinea Kurochkin, 1968 (proximal ulna) from the late Oligocene (Indricotherium Beds) of Kazakhstan (Kurochkin 1968a) and Palaeorallus alienus Kurochkin, 1968 (distal tibiotarsus) from the "middle" Oligocene of Mongolia (Kurochkin 1968b) were excluded from the Rallidae by Cracraft (1973a). Songzia heidangkouensis Hou, 1990 from the early Eocene of Songzi County (Hubei Province) of China is known from a partial skeleton, consisting of the skull, both hindlimbs, and an incomplete wing, and was classified in the mono-typic taxon Songziidae (Hou 1990). 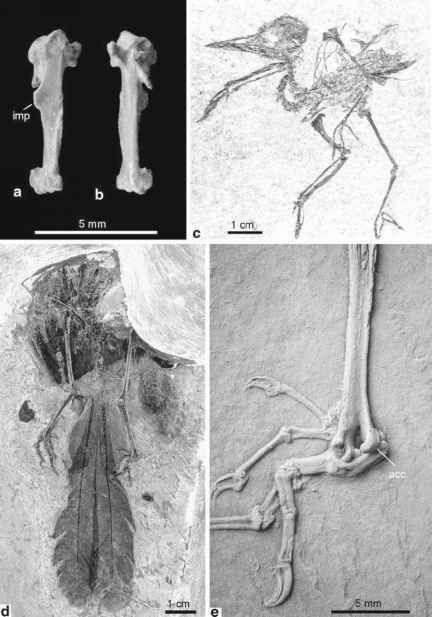 Although the specimen is rather poorly preserved, its proportions are rail-like, and a close relationship to the Rallidae was also assumed by Hou (1990). 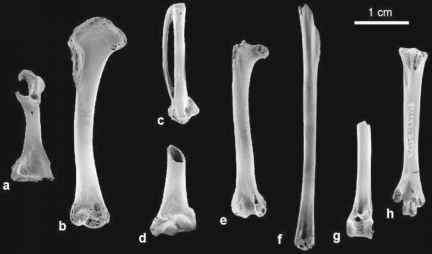 In particular, the tarsometatarsus of this small species is long and slender, the ulna is short, and the hallux and other toes are very long (Hou 2003). Nevertheless, proportions are a weak indicator of relationships of an Eocene bird, and the holotype specimen would certainly benefit from further preparation. 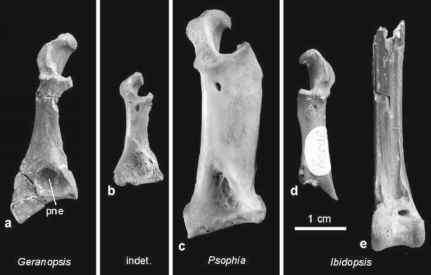 Accordingly, the earliest well-represented Rallidae are two species of Belgirallus, B. oligocaenus Mayr and Smith, 2001 and B. minutus Mayr and Smith, 2001, which are based on diagnostic postcranial bones from the earliest Oligocene of Belgium (MP 21). A partial skeleton of a rail from the early Oligocene of Germany corresponds well with B. oligocaenus in size and morphology (Mayr 2006c). This specimen is from a medium-sized species, about the size of the extant Water Rail, Rallus aquaticus, and closely resembles extant rails in its osteological features. The elongated toes allow an assignment to the Rallinae (all Rallidae except the African Nkulengu Rail, Himantornis haematopus), but a further classification within that taxon is not possible. Most other Oligocene Rallidae are known from a few bones only and tell us little apart from the presence of rails in European and African deposits of that geological period. This applies to a distal tarsometatarsus of an unnamed rail from the early Oligocene of the Jebel Qatrani Formation (Fayum) in Egypt (Rasmussen et al. 1987) and Rallicrex kolozsvarensis Lambrecht, 1933 from the "middle" Oligocene of Romania (distal tarsometatarsus). Remains of Paraortygometra porzanoides (Milne-Edwards, 1869) were reported from the late Oligocene of France by Mourer-Chauvire et al. (2004). Boles (2001b) indicated that rails were also found in the late Oligocene Etadunna Formation, and Boles (2005a) described a flightless rail in the extant taxon Gallinula, Gallinula disneyi, from late Oligocene to early Miocene deposits of the Riversleigh Formation in Australia. This species apparently existed over a time span of about 15 million years, and the fossil material consists of remains of most major wing and leg bones. Its flightlessness was inferred from the proportions of the limb elements. Whereas extant rails include several flightless insular species, flightlessness in the continental G. disneyi is more unusual, as the species coexisted with marsupial carnivores. If correctly assigned to Gallinula, this species would be the earliest known crown group representative of the Rallidae. Boles (2005a) even assumed that it may be on the stem lineage of the extant flightless Tasmanian Native-hen (G. mortierii).